Local photographer Alvin C. Jacobs, Jr., flashed a humble-but-knowing grin at staff historian Brenda Tindal of Levine Museum of the New South when she introduced him as "a modern-day Gordon Parks" at a recent preview for the museum's new K(NO)W Justice K(NO)W Peace exhibit. Jacobs, 42, admitted that when he was in his late teens, he often wondered if he would have it in him to fill the shoes of a civil rights hero like Parks. "I asked myself what type of man would I have been if I were this age in the '60s," Jacobs said. "How responsible would my life be? How impactful would my responsibility be? I started to find out about five years ago." By chance, Jacobs found himself in Orlando on February 26, 2012, the day Trayvon Martin was shot and killed by George Zimmerman. He quickly realized he was at ground zero of the biggest story in the country, but had no way of knowing how things would unfold from there. "I didn't realize that that was going to be the launch pad for a series of killings, of murders; almost a summer without ending. It's been that way from that day until now," Jacobs said. "From that day forward I vowed to myself that I would never be without my camera, and I had an opportunity and a responsibility to document creatively and professionally what was going on in America." Shortly thereafter, Jacobs hit the road to do just that. He traveled to Chicago; New York City; Charleston, South Carolina; Ferguson, Missouri; and — eventually and unexpectedly — back home to Charlotte to document the unrest fomenting as a result of police brutality and other injustices. 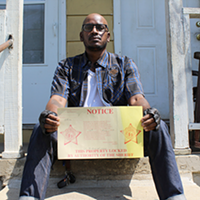 A man in Ferguson, Missouri, holds a sign depicting what would later become the title of the new Levine Museum of the New South exhibit. 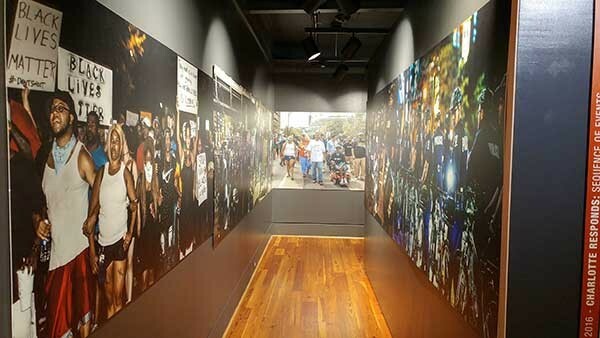 The resulting photos make up a portion of the K(NO)W Justice K(NO)W Peace exhibit, which opened on Friday and aims to tell the story of recent local and national police brutality and the resulting protests in a historical context. "The arts provide emotional release around issues like this, history provides the understanding, so we need each other," said Katherine Hill, Levine Museum's president. "This is a complicated story and it's important that we understand the multiple perspectives that exist around it." According to Hill, the exhibit had been on the museum's schedule to run in 2018, but everything changed after the events of September 2016, when the police shooting of Keith Lamont Scott was followed by intense protests that eventually convinced the city and state to call in the National Guard. Hill says the fact that such unrest was happening here in our city helped persuade organizers to expedite the process of putting together the K(NO)W Justice K(NO)W Peace exhibit. It acts in places like an incubator for dialogue, displaying placards with insight from community members who were both on the front lines of the Charlotte Uprising — from police and other first responders to protesters and independent journalists — and those watching from home. "We hope that our visitors will take the time to consider those multiple perspectives and to imagine how we might engage in productive, constructive dialogue around those differences," Hill said. "It's important that we have those conversations now, because the decisions that we're making now are writing Charlotte's future." The exhibit begins with perhaps the most important section, an educational walk through that touches on the history of Charlotte "from Swann to Scott," as Levine historian Brenda Tindal refers to it. The section informs museumgoers of the relativity of housing, schooling and policing to economic mobility and racial divides on a local and national level. "The idea is that Charlotte is in many ways a microcosm of the nation, and that what's happening in Charlotte is happening elsewhere," Tindal said. "We wanted to be able to provide that historical context for our visitors so that they understand that what happened here in Charlotte did not happen in a vacuum." An interactive map of Charlotte can be covered with multiple overlays that range from police shootings to school segregation and performance to income inequality, each result more jarring than the last. "[The map is] a way to sort of say that all of these things are in conversation with one another, that none of it is happening in a vacuum and that in order to understand Charlotte — in order to understand what happened here in Charlotte — we need to understand what's in the ground," Tindal said. "What are the issues that conspire to make Charlotte both this beautiful place and at times a very challenging place for segments of our community?" The exhibit becomes more visual from there, as patrons either branch off into a tunnel filled with the sights and sounds of the protests — life-size photos of the frontlines line the walls while audio plays of people yelling and tear-gas canisters exploding — or to the community response section. A tunnel lined with life-size photos from the Charlotte Uprising also plays audio of the protests from above. Throughout that section, mementos of modern history are scattered about, including a white dress shirt, recognizable to those who followed the protests as one of those worn by Toussaint Romaine, the sharp dressed public defender who gained national attention as he often stood between protesters and police, helping those in the line of fire find cover from the exploding canisters around him. One of those canisters lies next to his shirt in the display. Another glass case displays two pairs of shoes that each walked countless miles in the days and weeks following the Scott shooting: a pair of boots worn by then-Captain Mike Campagna of the CMPD, known for walking alongside marchers engaging with them throughout the week and a pair of red-and-white Nike Air Force One sneakers worn by Braxton Winston, whose live streams were crucial to showing viewers what was happening on the ground beyond what the mainstream media was showing during the protests. Tucked away in the back of the exhibit is a touching project that's been carried out by Johnson C. Smith University students over the past three years. The display, titled "Beyond the Hashtags," aims to humanize the victims of police violence that are too often seen simply as statistics or dismissed as thugs. It includes family pictures and explanations of the circumstances that led to the death of each victim. Artwork painted on the boards that once served as replacements for the windows of the Hyatt House that were smashed during protests. Dr. Tiffany Packer, assistant professor of history at JCSU, was inspired to start the project in September 2013 following the death of Jonathan Ferrell, who was killed by a CMPD officer in northeast Charlotte following a car wreck. She began discussing ideas of how to honor Ferrell and other victims of police violence with her class, and eventually decided to let each student choose someone they wanted to spotlight. Students got in touch with victims' families and were able to obtain family photos and other details to pay homage to each respective person. "What became obvious is that police shootings started to happen so frequently that they were just becoming numbers, so I said, 'How do we put identity back to these victims? I want you to put their lives back together,'" Packer said. "What becomes obvious is that these people are human beings just like you and I, and they live and they get up and they work or they go to school, and they have wives and they have husbands, they have children who love them just like we do. They are people, and that's what I want people to walk away knowing and understanding, that we are not talking about numbers, we are talking about real people in real time." 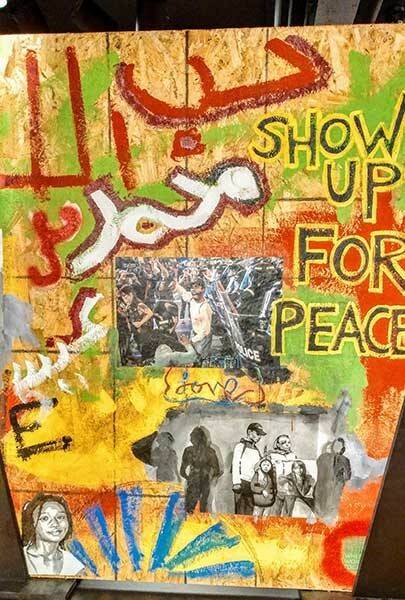 The exhibit wraps with a room full of Jacobs' work, which depicts large protests in Brooklyn, a small action at a private event in Charleston and everything in between. The work includes portraits of folks Jacobs has come across during his work, including Blake Brockington, a Charlotte activist and trans teen who has since taken his own life; Darren Seals, a leader of the Ferguson protests who was found murdered there last September; and Sabaah Folayn, a protester who would throw up her first in a dramatic pose each time she ran into Jacobs. 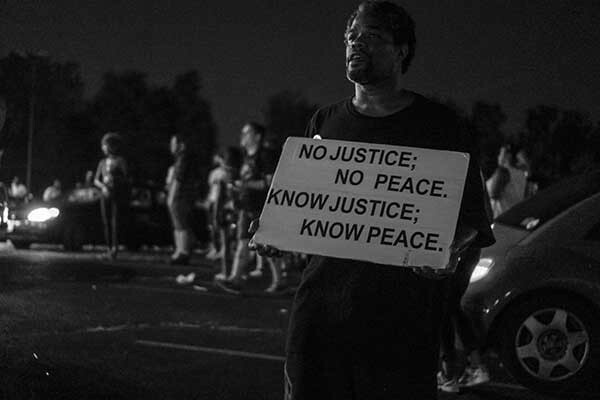 Folayn's Ferguson-inspired documentary Whose Streets? premiered at Sundance Film Festival last month. Jacobs stays connected to his work, separated from it only by a relatively short 35- or 50-millimeter lens. He scoffs at the idea that a false sense of objectivity would somehow help his photojournalism along. "Most of my images, you'll see I get real close because I only have a short lens. I have to get in the photo, I have to get in the shot, in the moment." Jacobs said. "I was asked how do I remain neutral. I'm a black man in America, I have to have an opinion. I can't remain neutral. I am in it." 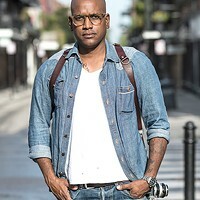 Jacobs remains aware of his inability to disconnect from his subject matter as a black man in America, and it helps him keep his focus. Looking at a photo of Eric Garner's mother, whose son was killed in 2014 by NYPD officers who placed him in a chokehold after confronting him about selling cigarettes on a street corner, Jacobs marveled at the resiliency he was able to in her smiling face. "To me my job was to begin documenting what a lot of our mothers are going through — a lot of our brothers and sisters and cousins and uncles and families and friends and people that we never even met before are going through," he said. "I'm not the best writer, I'm not the best speaker, but I can take a decent photograph, and I think that's becoming an increasing responsibility in 2016 and 2017 and beyond."